Update: February 4 (9:04 am ET) – OnePlus is now selling the special McLaren Edition of the OnePlus 6T on its web site. This version of the phone has 10GB of RAM and 256GB of onboard storage, along with a special 30W “warp charge 30” charger that will give the phone a day’s worth of battery use in just 20 minutes. It’s priced at just $699. Original story: November 6: – The OnePlus 6T started out as one of the year’s most anticipated releases. However, when news broke that OnePlus would drop the headphone jack from the device, many Android fans outright rejected the phone as a contender for their next smartphone buy. For those of us who can look past the removal of the beloved headphone jack, the OnePlus 6T is still an amazingly cool phone with some great specs, featuring an in-display fingerprint scanner, a tiny, barely-there display notch, Android 9 Pie, and — for the first time ever — carrier support from both T-Mobile and Verizon. If you are ready to find out more about how to get your hands on the OnePlus 6T, read on! Here’s all you need to know about the OnePlus 6T price, availability, release date, and more. 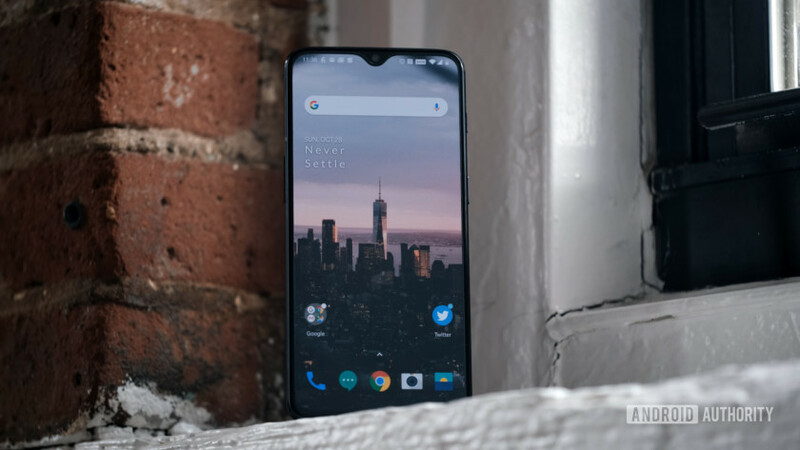 OnePlus launched the OnePlus 6T on October 29, 2018 (after a shuffling of the launch date due to a certain company in Cupertino forcing OnePlus’ hand). OnePlus opened U.S. orders for the device via OnePlus.com on November 1, 2018. If you would rather buy the device from T-Mobile in the U.S., you can do so right now by walking into one of the 5,600 T-Mobile stores selling the device across the country — this is the first time that has ever been possible. You can also buy the device from T-Mobile’s website today if you like. However, do keep in mind there are some differences between the device you get directly from OnePlus and the one you get from T-Mobile, most notably slower software updates. OnePlus 6T price and availability — U.S. Surprisingly, the OnePlus 6T base model is launching for only $20 more than its predecessor, the OnePlus 6. In the United States, the device starts at $549 for the variant with 6GB of RAM and 128GB of storage. There will also be a variant with 8GB of RAM and 128GB of storage which will cost $579, which is the same exact price as the middle variant of the OnePlus 6. The highest-end model, with 8GB of RAM and 256GB of internal storage, will set you back $629, which also is the same price as the highest-end OnePlus 6 model. This time around there are only two color options: Mirror Black and Midnight Black (a.k.a. matte black). You can choose between both colors for the 8GB/128GB model, but are stuck with only Mirror Black for the 6GB/128GB model and Midnight Black for the 8GB/256GB model. The McLaren Edition has a black carbon fiber design with McLaren’s signature “Papaya Orange” color around the rim. Those of you looking forward to a Silk White variant are out of luck, unfortunately. However, there might be a red variant launched later on, if the OnePlus 6 and OnePlus 5T are any kinds of indication.